Do you remember the 2011 lawsuit from the Organic Seed Growers and Trade Association 80+ plaintiffs (farmers and small businesses) against Monsanto? They were fighting biotech giant Monsanto’s ability to sue them for patent infringement when genetically modified seeds inadvertently appear in organic/conventional fields. Yes, were talking about the wind or insects carrying GM seeds onto another farm, which to them is considered contamination. But instead of the ability for the farmers to sue for a ruined field, they can be cleaned out in court for not having permission to plant patented seeds. Monsanto workers have been found trespassing and gathering evidence on farmers’ properties. The lawsuit had sought protection from this overreach, as Monsanto has filed 140 of these suits and settled 700 without suing. Our farmers want nothing to do with Monsanto. 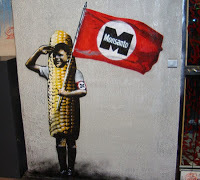 We are not customers of Monsanto. We don’t want their seed. We don’t want their gene-spliced technology. We don’t want their trespass onto our farms. We don’t want their contamination of our crops. We don’t want to have to defend ourselves from aggressive assertions of patent infringement because Monsanto refuses to keep their pollution on their side of the fence. We want justice. We don’t think it’s fair that Monsanto can trespass onto our farm, contaminate and ruin our crops and then sue us for infringing on their patent rights. As Rady Ananda points out, a “trace amount” in this ruling, only means less than one percentcontamination of a crop! Those are not the percentages of contamination in the real world – i.e. Monsanto can sue, sue, sue. Furthermore, less than one percent contamination still leaves the integrity of an organic crop ruined. It does not settle the issue of Monsanto trespassing on private land to take samples for infringement cases. However, Petitioners risk being contaminated in amounts much greater than 1%, and thus remain compelled to forgo full use of their land and adopt genetic testing of their seed supplies in order to avoid being accused of patent infringement by Respondents. The Supreme Court would not hear the case* on Monday, thereby sealing the previous decisions in the district and federal courts. Monsanto can sue with full immunity if one percent or more of a farmer’s crop contains their patented seeds. Monsanto never has and has committed it never will sue if our patented seed or traits are found in a farmer’s field as a result of inadvertent means. The lower courts agreed there was no controversy between the parties, and the Supreme Court’s decision not to review the case brings closure on this matter.